The Happiest place on the Blogosphere. There are several ways in which to get the most out of your “meet and greet” with your favorite Disney Characters. As a performer at Walt Disney World, I can tell you that I’ve seen and experienced it all – the good, the bad, and everything in between. I have therefore compiled some tips and information for you in order to help make this experience the best for your family. This blog post is created to help you better your experience and maximize your “meet and greet” time with the characters. There are a couple of things you can do to be prepared before you ever meet the character. 1. Have your autograph books and cameras ready. This will give you more time to play and interact with the characters versus trying to get your book out or camera ready. This also helps the line go quicker. 2. Take off jackets, bags and/or ponchos. Doing this makes for better-looking pictures. Waiting until you get up to the character takes away from your time to interact with them. 3. Put down any food or drinks. The characters will not take pictures with them in the picture. When you approach the Disney character, don’t shove your book into their hands. 1. They want to say hi first with a hug or a high five. They want to know you are there for more than just a signature. 2. Make sure the character sees you approaching. They don’t have the best eyesight, and at times they don’t even realize there is a young child by their legs. 3. Please do not jump up on them. 4. Be careful when touching their heads – it’s actually preferred that you don’t touch their heads at all. 5. Everyone must be wearing shoes unless they are being held. 6. They cannot hold your baby. 7. Don’t be rough with the characters. They can be hurt! I’ve seen hundreds of families that wait in long lines to see the characters only to get up to them and find that their child no longer wants to see them or is crying. These tips will help you get those pictures without the big hassle or need for convincing. 1. Let them watch the character interact with the other families and talk to them about all the fun the other families are having. 2. Holding the child or getting down to the child’s level helps the child feel safe and protected. 3. Hold the child’s hand while walking up to the character. 4. Ask someone to take the picture for you so you can stay with your child. I usually ask the family behind me to do it just in case there isn’t someone at the front of the line to do it. Always check the photo before moving on, as not everyone knows how to use a camera correctly. 5. When taking a picture with your child, put them on the outside shoulder away from the character. By doing this you will help keep them from looking at the camera instead of at the character and/or help them stop crying. 6. If the opposite shoulder strategy doesn’t work, take several steps in front of the character, get their attention to look at the camera, and take the picture. This helps because the child is far enough away that they feel a bit safer and you still get a picture with the character. By having the right kind of writing utensils it will help you get the best signature possible. 1. Even before you hand the character the autograph books, make sure you use the words “Please” and “Thank You”. These words are often forgotten, but greatly appreciated! 1 – 2-inch pens are hard for anyone to write with, and with a paw it is even harder. 2. Light ink pens or coloring utensils make it hard for the characters to see what they are signing. Use dark ink or colors for signing. When the character can see what they are signing you will get a great signature. 3. Larger-than-life pens are also not the easiest to write with for the characters. The thickness of the pen does make it a bit hard to get a good grip for a great signature. 4. Disney characters’ favorite type of writing utensil is a regular-sized SHARPIE. The inks are thick and they are extremely easy to hold. 5. Characters love it when you use different colors – For example: Tigger loves using Orange colors, whereas The Green Army Man loves using Green to write. 6. The characters also love writing with the fun different Disney pens. They love tickling your faces with the ones with the fuzz on the ends or twirling the character on the end of the pen. They especially love pens with themselves on them. 7. 2-inch size papers or loose papers without something hard behind them are hard to sign on. If you are going to have the papers loose, then use a small clip board. Doing this will help you get the best quality of signatures possible. Disney characters love to sign their name on things, but there are a few things they cannot sign. 1. They cannot sign currency, checks, receipts, other important documents, or things with inappropriate materials on them. 3. They can’t sign anything while it is being worn. You can take the item off only if it doesn’t reveal skin or undergarments. 3. Be creative with your pictures. Don’t just stand there; strike a pose! They take thousands of pictures a day with guests posing the same way and they are eager to do something different. Go with the flow – If they want you to pose a certain way, do it. They do some great poses. You can even ask them, “What pose should we make today?” and they will respond with some great ideas. If you have some ideas, they will also join in, as long as it is appropriate. 4. Use more than just your phone camera – you will get better pictures using a real camera. 5. Take a “Selfie” with the characters. 6. Share with the characters why you love them and are there to see them. When you leave, make sure you thank the Disney characters and the character attendants for letting you come and see them. It’s not easy standing out in the heat all day, but it’s worth it when they feel appreciated and loved. Give last minute high fives and hugs! 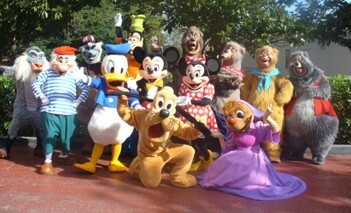 If you are planning a trip to one of Disney’s theme parks or a Disney Cruise, please contact me for more information. Posted on May 17, 2014, in Disney Characters, Disney Cruise Line, Disneyland, Walt Disney World and tagged Aulani, Characters, DCA, DCL, Disney, Disney Animal Kingdom, Disney Atmosphere, Disney California Adventure, Disney Characters, Disney Cruise Line, Disney Hollywood Studios, Disney Parks, Disney Tips, Disney Travel, Disneyland, Disneyland Paris, DL, DLR, Epcot, Magic Kingdom, Travel, WDW, Wish With Cody, Wishwithcody. Bookmark the permalink. 4 Comments. Thank you, Cody, for this great tips post, from all your special Disney friends! If you need other great tips for your trip next summer feel free to contact me! I know most everything about the parks! … Thank you for commenting and reading my blog! Cody, from your fellow DLR CastMembers in CA, thank you so much for writing this. As a fellow performer, this is wonderful as the guests who read this will be able to make the most of the the character experience and our performers and hosts will have a smoother day having fun meeting guests. Once again, thanks and hope you have a Magical Day. Up to 25% Savings on Select Tropical Disney Cruises from Both Coasts!